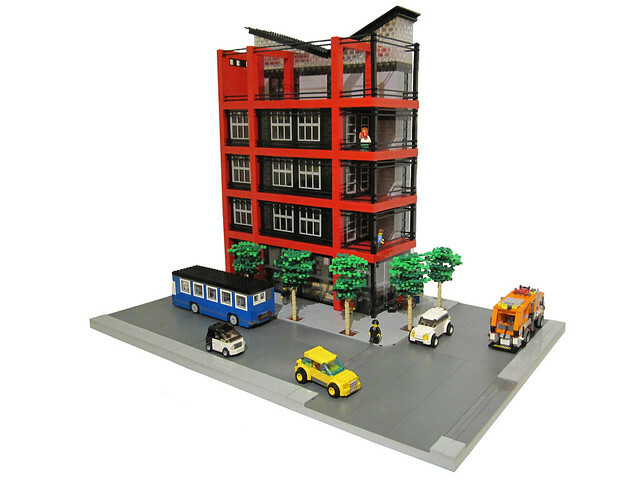 Brick Town Talk: Modern Architecture - LEGO Town, Architecture, Building Tips, Inspiration Ideas, and more! Indianapolis, Indiana- (BTT) Apartments aren't always blocky, boring, and repetitive. Sometimes, they're freestanding and unique. This fine building falls right into that category. From the "Vee" rooftop, to the glass-encapsulated bottom floor, this has all the traits of a modern city building. Apparently, it's not new enough to escape the touch of modern street art, or as the rest of us know it, graffiti. The large brick built street helps to draw the eye to the building, then it steadily progresses up to the skylight at the top, ending in a pleasing overall view. Would love to see more modern Lego architecture!